The Big Pharma era is coming to an end. By Big Pharma, I’m talking about the dominance of companies such as Pfizer and Merck in selling pharmaceutical drugs to people. Companies like these created the modern pharma industry by coming up with drugs that doctors are persuaded to prescribe. Now, in truth, the real-world basis for prescribing the drugs that Big Pharma makes has always been suspect. Most drugs that meet the standards of clinical testing often fail in the “wild” of general use. That’s because real-world conditions are nothing like the pristine, perfect conditions that you see in clinical tests. And second, and more importantly, these drugs simply don’t work in most people because of small variations in our genetic codes. Now, a new era of medicine and health care is dawning. And I believe that this new era is going to deliver better medicine that works in more people … and through this, better health care. This new era of medicine and health care is the era of precision medicine. The era of precision medicine is going to be driven by data and information. This form of medicine is going to look to do a much better job of diagnosing your condition. We can do this by using data in your digitized health records to match against our knowledge base of how different diseases and conditions present themselves in real-world conditions. Now, instead of using an informed guess by your doctor, your condition will be diagnosed more accurately based on decades of scientific data across studies and research and also the data of millions of other patients who have gone through the same condition. The second thing the era of precision medicine is going to do is make certain that the medicine you are taking is right for you. For any given disease or condition, there are numerous medications that have been tried out. However, the pharmaceutical companies use their marketing and sales power to ensure that their expensive branded medications are the ones that doctors prescribe to you. Now there’s a better way. Using the data that we have and tests based on our genetic code, we have a good understanding of why one drug works better for one person versus another. 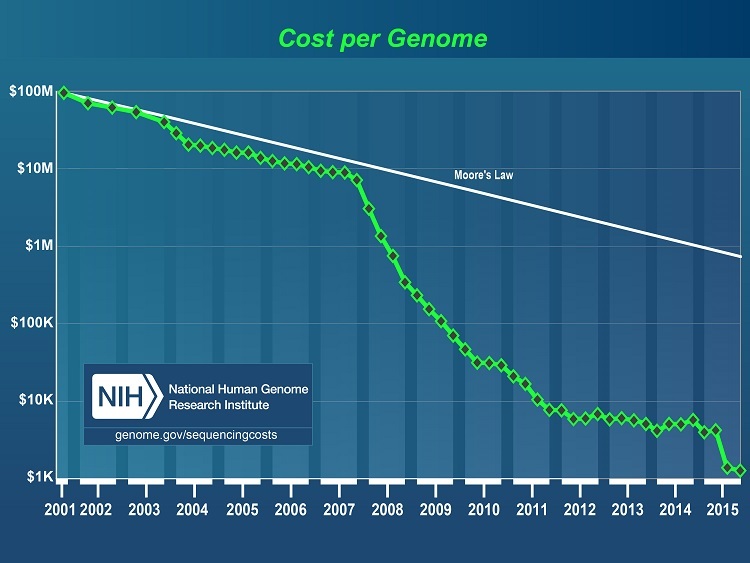 And with the cost of decoding our genetic code plummeting down from $250,000 to $1,000 … and even further down to $100 soon … we are rapidly coming to a time when you get a drug that is precisely suited for you … one that maximizes your medical benefits, minimizes your side effects and matches your particular set of symptoms. This era of precision medicine is something that I’ve been tracking now for nearly 20 years … since the first announcement of the decoding of the human genome. And now, I believe the time is right for the era of precision medicine to begin because of the vast amount of data that’s been collected on our health through electronic health records, and also because the cost of decoding the human genome has plummeted to the point where we can use it as an everyday thing. All of this makes a huge difference in getting a good diagnosis and being matched to the right medicine. For investors, this has huge implications, as you’re going to see a massive shift in value from the Big Pharma companies to companies that are going to deliver better diagnoses and match people to the right medications — in other words, the companies that can deliver precision medicine to their patients.